As the recession continues, President Barack Obama has chastised the 'fat cats' who feast off government bailout money while unemployment remains high and smaller businesses struggle. But according to business reporter Charles Gasparino, Obama is faking his outrage, and his calls for new policies to rein in banks that are 'too big to fail' are just pabulum. In reality, Obama has climbed into bed with Wall Street CEOs, giving them what they want so they will support his liberal, big-government agenda. As a result, the big banks responsible for the credit crisis get rescued, while small businesses and ordinary Americans get crushed by higher taxes and irresponsible spending. 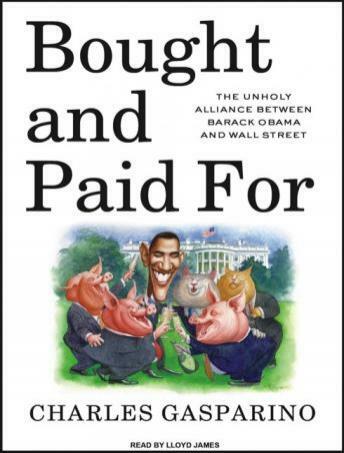 Gasparino draws on interviews with dozens of key CEOs and political players to trace the roots of Wall Street's twisted love affair with one of the most liberal presidents in American history. He shows how, for decades, big banks and big business have colluded with big government, thereby laying the groundwork for today's shady dealings, and how the same bankers Obama now publically reprimands have supported him-not because he promises change, but because he promises business. Written in Gasparino's characteristic no-nonsense style, this book is a wake-up call to all Americans to strike back against the people and policies that are ruining our country.